Lovely day to belt round Danestone and we didn’t really need the hall although it made a great spongey football pitch at the end. Good to see all our SOULmates from down south and up north – hope you enjoyed yourselves as much as we did hosting. Many thanks to all our helpers: Helen and Stuart Anderson, Rob Hickling, the Gomersall 3, Gordon Urquhart, Alex Maclachlan, Marianne and Patrick Lang, the Farquharson 3, Evgueni Chepelin, the Griffin 3, Jeremy Huthwaite and first and last the Danestone Community Centre jannie. Great sprinty course from Sam which kept everyone concentrating right to the end and a fitting finale to this year’s series. 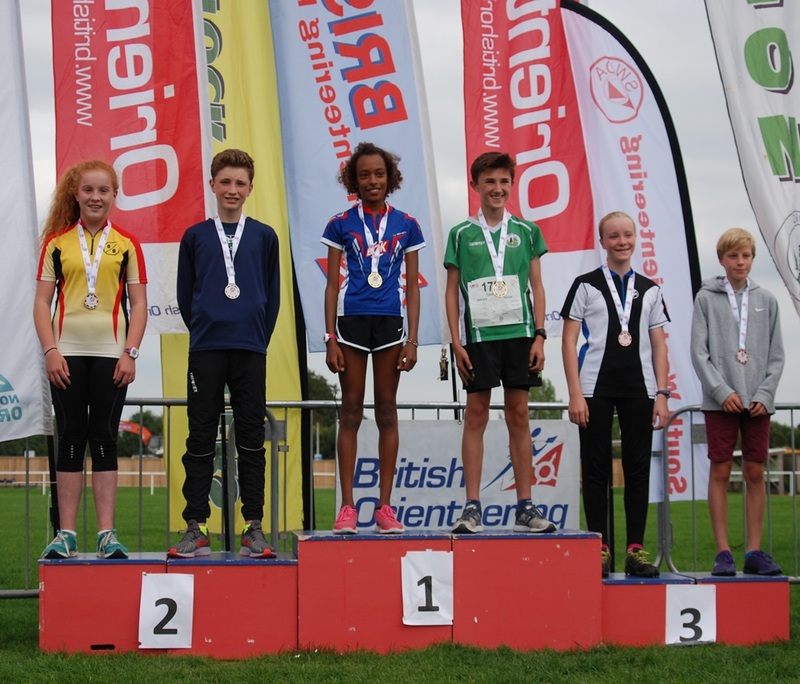 Perhaps only to be expected from one of our juniors who is proving to be rather nifty at Urban Sprint races recently coming 2nd at the British Sprint Championships in Bath. Ranking after 5 Wed events Ranking after the 5 Wed eve events. SOUL results yet to be added … coming soon hopefully! The old 3-controls-in-a-straight-line caught one or two folk out tonight or was it just getting too dark to see the map? Must be autumn – had to put the headlights on to get home. Helps us to “void” leg 10 – 11 or in other words, subtract the time it took you to cross the road but throws a real spanner in the works when it decides to die on us mid-event. I’ve guesstimated a split time for all of us affected by 248 keeling over – very arbitrary but at least we now all have times. Apologies about the printer also deciding to die as otherwise we could at least have sent you away with a provisional printout to look at pending my tweaking. Hope it’s feeling better again by next week. I’ve also guesstimated age classes for some of you. Jeremy needs to know this so he can put you into the right urban category as he’ll be producing rankings soon now we have 3 events under our belts. If I’ve got it wrong then please accept my apologies and let me know via webmaster@grampoc.com and I’ll correct them. 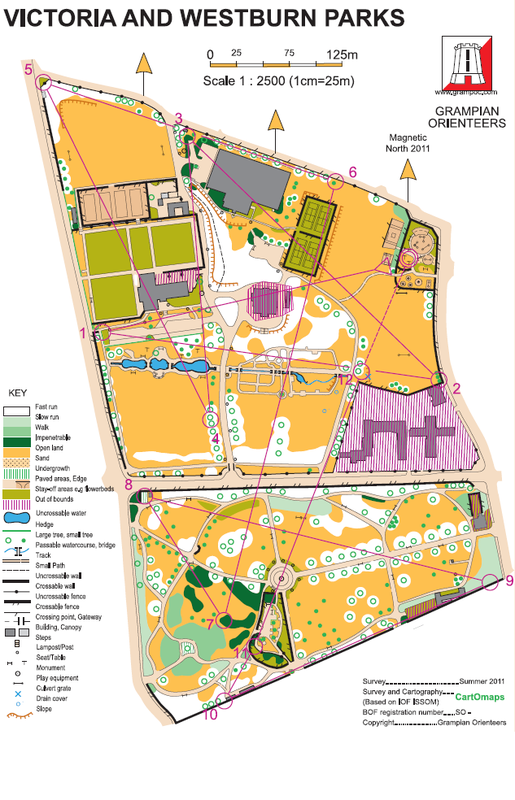 Did anyone other than Lyndsey try the Friends of Victoria and Westburn Parks tree trail map ? She said spotting small metal plaques is a lot harder than spotting kites. Everything went well apart from the control on the Tower going for a bit of a walkabout. Do you get tungsten tie wraps? And as the sun was setting on Seaton Park the feedback was….Urban hmmm…… hills, mud and nettles!Thanks to all who turned up and special thanks to Ian McLeod for collecting controls. Thanks go to Dennis McDonald for organising and also to the two passersby who rescued and looked after number 13 for us – the one by Wallace’s Tower. If you’re reading this it was much appreciated not only because it gave me a chance to get my breath back and it was nice to meet you and chat for a wee while. One course of TD3 (Orange) standard about 3 – 4km long in streets and parks. Final rankings have now been calculated and posted above. A great lesson in reading your control descriptions carefully tonight (Team JFF had photographic evidence of number 5 skulking on the wrong side of the fence to where they were) and if that didn’t catch you out then the straight line belt from 11 to 13 missing out 12 did. Thanks to David for a fitting finale to this year’s series. Couple of folk got caught out by the loop from 10-11-12-13 and forgot one of the controls. Oops! The rest of us just caught out not reading the map properly around that area and at least two of us realised afterwards that we used key alleyways once but then promptly ignored them a second time around. Mind games – “surely the planner can’t mean me to go back up there?” – are intregal to the urban challenge and we really should have known to expect some crackers from Pete! Overall points after 4 races here. And standings by age category here. Lots of folk look to have it in the bag already (e.g George, Lesley, William Nicolson and Sam Griffin) but some other categories are still up for grabs theoretically and a mispunch next week could shatter a few dreams of receiving one of our much-coveted trophies so make sure you watch for the LED flash – should be easier next week as it’s darker sooner all the time. Results Sorry, no Splits this week as the laptop was playing up. Hopefully business as usual next week. Thanks to John Lang for several interesting route choices tonight leading to differences of over 500m recorded on different folks’ GPS. Do you take the time to eyeball the differences accurately before committing or do you just plump and then run as fast as you can along your chosen route? Different control seemed to cause a few “mp” tonight but again we’ve given you all the benefit of the doubt as many had eye witnesses and you would have had to run pretty much past it anyway on the way back into the park. Don’t forget to check for the flashing LED before leaving a control. If you were a trophy winner last year, please bring it back and hand it in to registration at any of the events. I’ll post details about Westhill tomorrow. Overall points after 2 races here. Scroll to the bottom for an explanation of the age categories used in Urban Orienteering races. 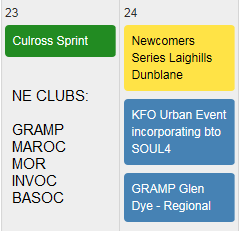 Check the Scottish Orienteering Urban League page for details of bigger urban races in various locations throughout Scotland and if you happen to be in the right town at the right time then give it a go. (If I’ve mispelled a name or mis-guessed an age group let me know webmaster@grampoc.com. Thank you to Tim Griffin and helpers for kicking off this year’s series in grand style. 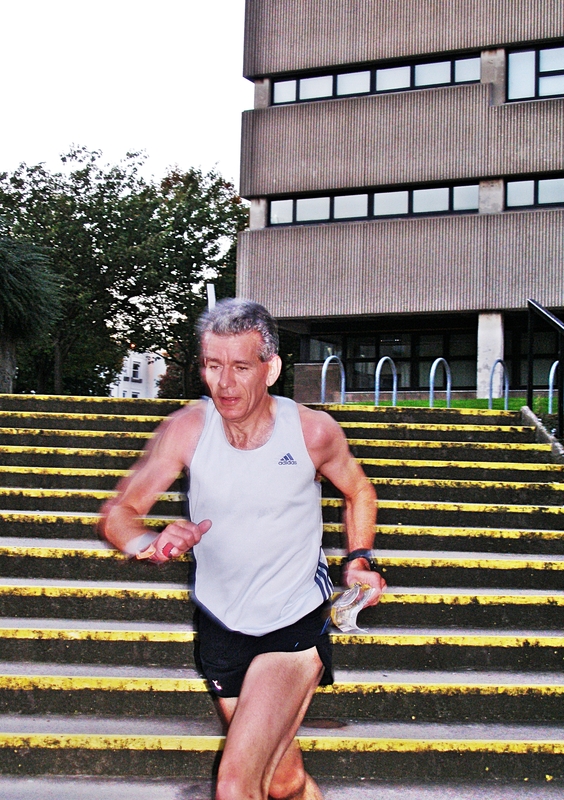 50 runners – which may be an Urban Sprint record for Gramp – zig-zagging back and forth at incredible speeds in some cases, although William did look as if he’d been for a swim half way round by the time he collapsed at the Finish. One or two folk had trouble getting number 8 to register whereas others had no problems. I’ve given you all the benefit of the doubt, and the person who didn’t start their brikke properly so it read 64 minutes initially, and re-instated you as it’s the first in the series but remember it’s your responsibility to check all controls flash at you to indicate a successful read. Worth sacrificing a few tenths of a second to make sure you’re not disqualified in future. Last in the series using a newly refurbished map courtesy of Janne Heikkinen of AUOC. Thanks to the Gomersall family for planning and running the event. Congrats to the category winners – prizes will be dished out at the AGM. Lot of fun had by all – thanks for coming and supporting the series and see you all next year I hope. The split between 12 and 13 (crossing Westburn Road) has been removed when calculating the Results. Congrats to the joint winners Angel and William. W & V Parks are very flat and direct line running was possible for many legs so it produced some very quick times from the fast folk at the top of the tables. Overall points after 4 events. Game on for Aberdeen Uni next week! The Jury decided we should void the leg from 4 to 5 as he control description for 5 didn’t include the vital bit of info as to which side of the uncrossable fence the control was placed and was therefore unfair. The results have therefore had that leg deducted from your overall time by the magic of OE2010. You’ll find Routegadget still includes that leg though. I’ll post a quick guide to using RG tomorrow as it’s a very useful way of analysing what went wrong and what went right and worth using. And here’s a wee heads up – we shall be deliberately employing the same OE2010 magic next week so that the road crossing between Victoria and Westburn Parks isn’t included so no need to risk it sprinting across 3 lanes of heavy traffic. However, there will be an upper time limit on how long you can take to cross so don’t have too long a breather before punching on the other side and carrying on. Thank you Gordon for a much appreciated course judging by the buzz of conversation comparing routes at download and a few “DOH!” head slaps too as folk realised they’d missed a trick. Quite a few mispunches not least punching 6 instead of 16 in the mad rush to get to the finish although the two very similar numbers in close proximity could easily be confused especially if you had your map tightly folded. It pays to check your numbers especially when they come thick and fast. Maybe we should start producing separate control descriptions for the Sprint events? What do you think? What I have successfully managed to do is calculate some points. Best 3 of 5 scores count towards your total. If I’ve mispelled names or clubs or age classes or you want to run up in the Open rather than your designated class then let me know on webmaster@grampoc.com. 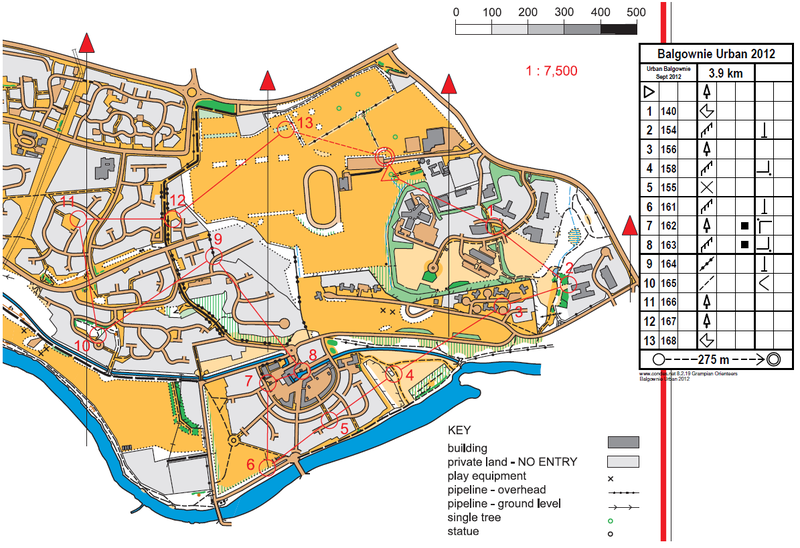 Glorious evening for some fast and furious/mellow and meandering* urban orienteering. Rachel – caught on camera at last! One course of TD3 (Orange) standard about 3 – 4km long in streets and parks, using detailed ISSOM standard maps. Wow! That was a blast! Never-ending route choices and plenty of twists and turns not to mention furkling in bushes and round the back of buildings in the dark towards the end. A big thank you to our guest planner, Janne, for cramming so much fun onto a piece of A4 paper. Funny how many of us switched off mentally just after the map change and went charging past a control which was more or less on a straight line between two others. We were so clued in to left, right, double back, left again by that stage that a straight line must have seemed just too easy to our fuddled brains so we dismissed it. Overall joint winners of the Series and MOpen are Janne Heikkinen AUOC and Mark Stockton GRAMP with the maximum possible 150 points apiece. Mark managed to pull a win out of the hat at the last race to equal Janne’s tally, narrowly squeaking in with 10 seconds to spare over a certain Angel (I’m-not-feeling-too-good-I-probably-won’t-run-tonight) Iliev AUOC. If you didn’t pick up your prize last night, get in touch and we’ll arrange something – email Rachel on webmaster@grampoc.com. Hope you enjoyed it all as much as I have and see you next Autumn? I need to tidy up a few details like clubs and age classes too so if you’ve spotted a mistake then let me know now webmaster@grampoc.com. We’ll be awarding points again this year – winner gets 50, 2nd gets 47, 3rd gets 44, 4th gets 41 and then decreasing one point for each place thereafter. 1 point even if you mis-punch or don’t complete the course. Don’t ask why but that’s the way it was decided to do it for the DNC so I’ve just followed suite! Get your flyers from Sam Gomersall at Templars Park and distribute them far and wide at work, college, sports centres, libraries…. Maybe stick a few on lamp posts in the areas we’re using or nearby. Wow! AUOC are really going from strength to strength with 11 runners and Janne busy coaching and encouraging after putting out controls as tonight’s planner. A great wee course making good use of the complex alleyways and extra vertical dimension offered by Aberdeen Uni which foxed many scouting round at the bottom of steps instead of looking up! Unfortunately, somebody took a shine to one of the controls and early runner Carolyn McLeod got waylaid searching in bushes for it before coming back to report it. Fortunately we managed to replace it in time so that only Iain McLeod was similarly affected. Although technically missing a punch, I’ve reinstated their results (which are eerily exactly the same to the second). If anyone in AUOC hears anything on the grapevine about where our control might have got to please ask for it back. Ta. Rob Hickling suffered a brikke failure and doesn’t appear to have self-timed so at present isn’t included in the finishers but if he has a time I’m sure he’ll let me know. Due to tonight’s monster turnout, some folk sadly don’t get any points as they go 30, 27, 24, 21, 20…. I can’t really change the points system for tonight’s event as that wouldn’t be fair on everyone but I have made a note to start much higher next year. Prizes will be presented at the AGM or got to you somehow, somewhen. Naomi will be taking home the WU16 prize for definite if not the outright winner at this rate, but Pete and David K will be battling out the MV prize as it’s pretty close and both have played their Organiser’s ace already. Similarly, MSV will be hotly contended if both Rob and newcomer to the Aberdeen O scene, Stefan Stasiuk, both make it next week and also two more newcomers Shona and Bethan in WJ category. You were warned to expect a dizzying course! Luckily it seems everyone rose to the challenge and enjoyed Pete’s zig-zagging 3km of confusing changes of direction and route choices in such a small area. The printouts we gave you are the raw splits, the times shown on these results include the voided leg (ooer!) between either side of the road so you may get a pleasant surprise when you check. When I made the joke at Reg about not having a 3 course meal and a nap while waiting for the Green Man it wasn’t meant as a challenge but some of you took full advantage of this feature to have a sustained breather while waiting for the lights, not least course winner Jack Gomersall taking 2:21, outdone only by Alex Lang with an even cheekier 2:58! Finally, keep your eye on Team Rennie who are really in the zone this season chalking up their second completed course ever this evening and setting a PB in the process. One more result like this and I’ll have to invent a serious prize for the ladies this year! A big thank you to the Essons’ combined efforts to successfully kick start the 2014 Autumn Urban Series at DP&F last Wednesday. David Kirk had a failed brikke, Norman Liley & Naomi Lang estimated time for first leg as Start control did not register, and our David did it on his bike. Evgueni ran before Start & Finish controls arrived (thanks to him for phoning Rob to bring them down) and timed at approx 25 mins – he will be awarded points based on that even though his name doesn’t appear on the attached results. Next up is Westburn and Victoria Parks with some cunning planning from Pete to pack 3km into that tiny area. You won’t know which way is up or down, never mind east or west by the time you’ve finished, but a whole lot of fun is definitely guaranteed!! Bbest 3 scores out of the series of 5 count for your total. Organisers do especially well as recognition of their efforts BTW so volunteer for next year now!! Prizes will be presented at the AGM or got to you somehow, somewhen, somewhere. Thanks to all who came out on such a foul night for the last of the Urban Sprints, especially members of the newly reformed AUOC who are probably still wondering what hit them both meterologically, physically and mentally. Please believe us when we tell you it’s not always like that! I did promise to be there armed with lavish prizes but it really wasn’t the night to be hanging about waiting to see folk and figure out who won in a couple of categories that were still potentially up for grabs. I will bring prizes to the Street O events (shameless plug!) or you can email me at webmaster@grampoc.com to claim if you can’t make those events. So – the final results…. I’ve been mulling over whether to award points as usual for Abz Uni or not. Dave’s event was so different from the rest and a bit of bad luck meant a disastrous time for the first leg for many and if anything, I should be awarding extra prizes for determination/pigheadedness to several folk who were hit really badly but still soldiered on. Luckily, the overall prize winners were unaffected by the rogue results – as in there was no change from those I’d identified as leaders in the results after 4 events – so I’ve decided to include Abz Uni anyway in the Overall Results (but I’ve also added a second page for interest where I’ve awarded points based on adjusted times with the first leg subtracted as that was the real deal breaker for most). *As the 5th event at Abz Uni didn’t follow the same format as the rest the points are debatable although it didn’t make any difference to the overall winners. So there are two versions of overall points – one with points as is based on finishing times recorded and a second version with points based on an adjusted time where I’ve subtracted the first leg times from everyone’s total as it was that first leg that was make or break, i.e. if you found the first control first time you were very lucky. Just for comparison here’s the overall results after the 4 normal sprint events too. Congratulations to Evgueni for winning the first urban sprint, with a time just under the 20 minutes for 3.4km. Nice planning by Mark Stockton took us round the park, a loop into Ferryhill through the narrow alleys, and finally back into Duthie to the finish. The new map (drawn to ISSOM standard) was great. 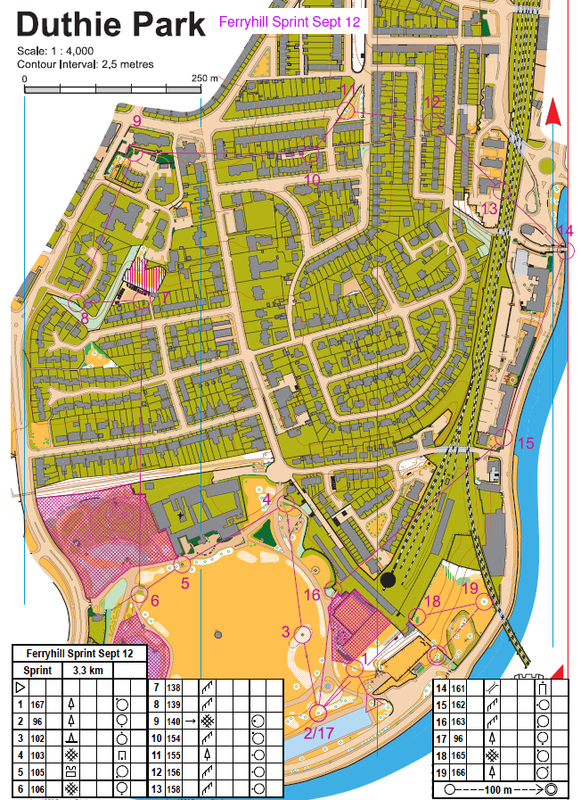 Westburn and Vicky Parks were a real eyeballs-out sprint – men’s winning time 14:17 for 3.5km shortest feasible route. We welcomed Oleg back to Aberdeen and he managed to beat his brother Sasha by 56 seconds. Sasha was a similar margin ahead of Alex MacLachlan – they’re all running very well. Fastest lady was Naomi in a tremendously fast 17:34! Mark Stockton was the star in the reasonably priced map at Balgownie, with a very smart winning time of 17:15, a minute ahead of the chasers. 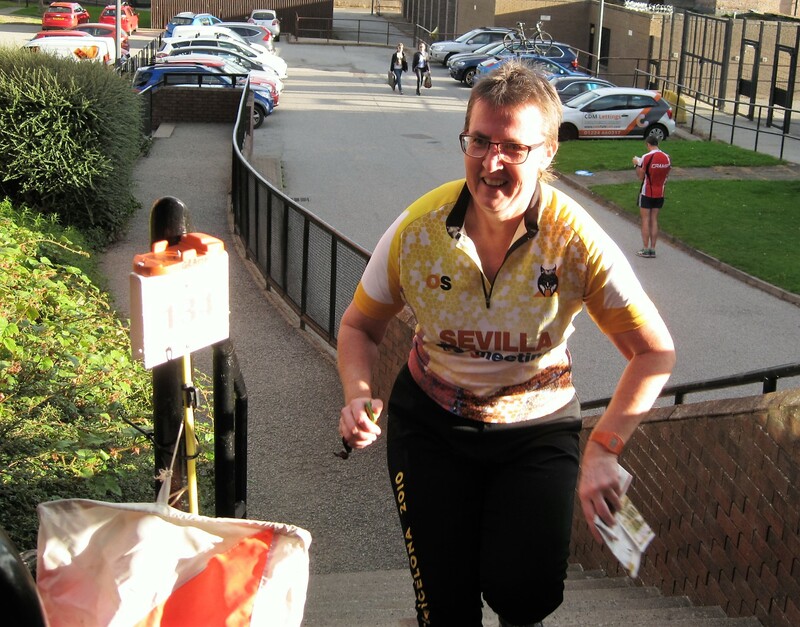 Fastest lady was new arrival Karen Maxwell, of Roxburgh Reivers, who has just started at RGU – a very big welcome to Karen (who BTW is car-less and would appreciate lifts to future events). Sorry for the absence of the splits printer – senility on the part of the person supposed to bring it – me! If you’d like it, you can find yours in the link to Individual Splits Printouts below. 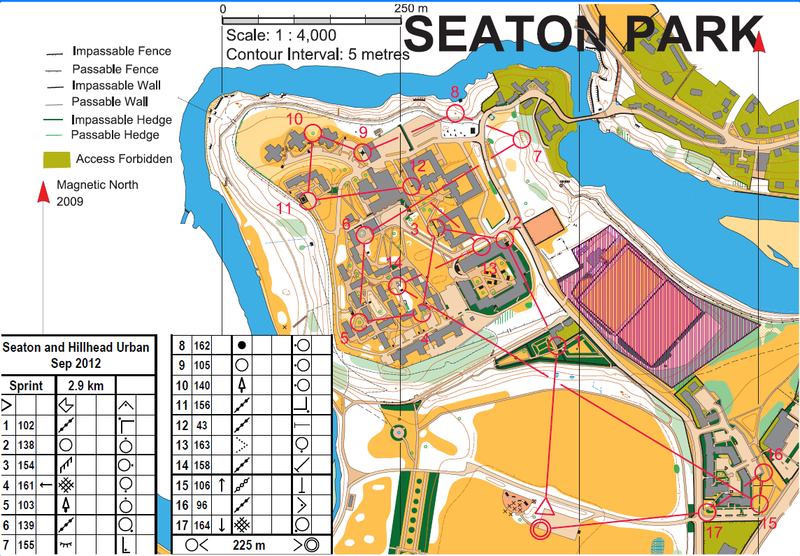 We got all the technology together for Seaton Park and Hillhead urban sprint, so everyone got their splits – hooray. Very tricky to avoid all the temporary fencing in the halls of residence, which was specially mapped by organisers Pete and Rachel – thanks guys. Leading lady was hill-runner par excellence Jenny Ricketts in 20:36 ahead of last week’s winner Karen Maxwell (recovering from “fresher’s flu”). Mark Stockton had some tougher (international) competition this week from Lithuania, Russia and Finland! He came out on top for max points again, in another sparkling time of 18:05. Well done Mr. Consistency. The final sprint of the season was in the pouring rain at Aberdeen University, which made the pavements slippery. But it didn’t seem to slow the leaders. 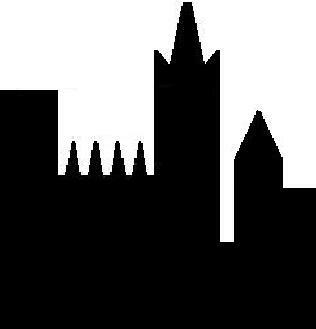 A big welcome to all the Aberdeen Uni O-Club folk!! The novel format was tricky in the rain, as our pens wouldn’t write on the maps – so memorising the order of controls was hard. I took 16 mins to find no.1 which scuppered my time! Thanks to David K. for the planning and organising. Another great little series again this year thanks to good planning and enthusiastic competitors with some very keen competition at the top of the league between various M18/M20/M21s and one or two older Ms with youthful legs. Calum McLeod and Naomi Lang had the Junior side sewn up and Carolyn McLeod met her match in newcomer to the sport if not the area, Ruth Crewe (Cosmics). As well as the GRAMP Urban stalwarts we also had several incomers join the league half way through (studying or working in the area this year) and if they had been able to attend more events then the leader board would probably look vastly different. Unfortunately we can’t really delay the start of the Urban Series to accommodate Uni term time as it’s already pretty dark by 7pm even early October and we run the risk of becoming an Urban Night League (although I bet we’d get lots of takers for that anyway as everyone seems to enjoy it so much – even those who aren’t uber-competitive and laugh the whole way round (you know who you are, Blaggers!!)). Westburn Park was done as map memory as it’s such a small area. Unfortunately the long legs were cropped so that it wasn’t obvious there are entrances to the Victoria Park side at east and west ends and a lot of folk were seen legging it over the uncrossable walls and fences on either side of the main road. Do you know the difference in the symbols and why they’re marked as such? How can we spread the word to newcomers to urban O? We decided to experiment this year by keeping the regular Wednesday pm slot going through the autumn by using some of our urban maps. Not quite as popular as the Summer Series but we still had a regular core of runners including some of our Cosmic friends who, although being more used to running flat out over the hills, still seemed to really enjoy the extra dimension of getting their heads around such detailed maps.